It’s amazing the difference the weather can make when you are smallholding. I can really see why sun worship has been so popular through the ages. Everything just feels so much lighter, hopeful and easier. We had been meant to go away this weekend but due to family illness it was cancelled last minute. We put the change of plans to good use though. Friday we made into a Chi day. Trip to the local garden centre to visit the owl centre, look at plants and seeds, have ice cream and look at fish. Followed by a quick stop in some shoe shops to get me some shoes other than trainers that I can put on without bending and have a dinner out. Home with an exhausted Chi so time for a boardgame. Nice and restful with plans to get smallholding at the weekend. Saturday started off with a smallholder’s club meeting. I’ll keep on saying that joining our local club was a really good move for us, being active in it has been even better. Sometimes you look at the long list of jobs you have and the forecast of good weather and think maybe we should skip it this month but it has always paid off when we have gone. It’s not just about the topic of the meeting (although this one was all about growing which was well timed for us as this year we are focusing less on livestock and more on growing). 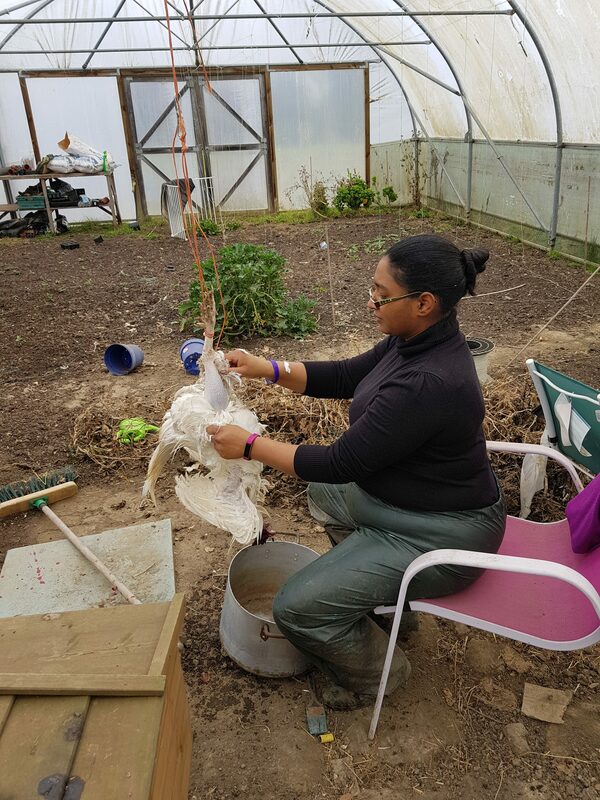 There is also a massive benefit to meeting other smallholders, making friends and getting ideas of how to set things up/fix things that you may not have thought of. 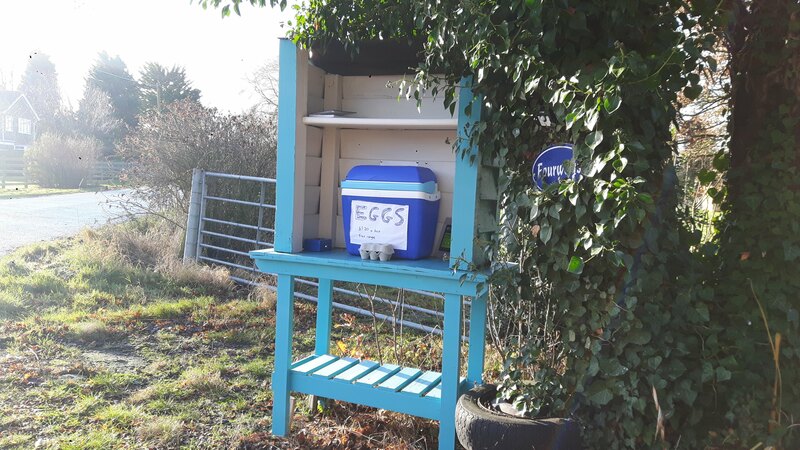 If you are a smallholder and have a local group then I highly recommend joining it. I picked up a lot of tidbits at this meeting and of course there is always cake! We grabbed some chips from McDonalds on the way home and headed straight outside. Sam got started on the compost heap again. 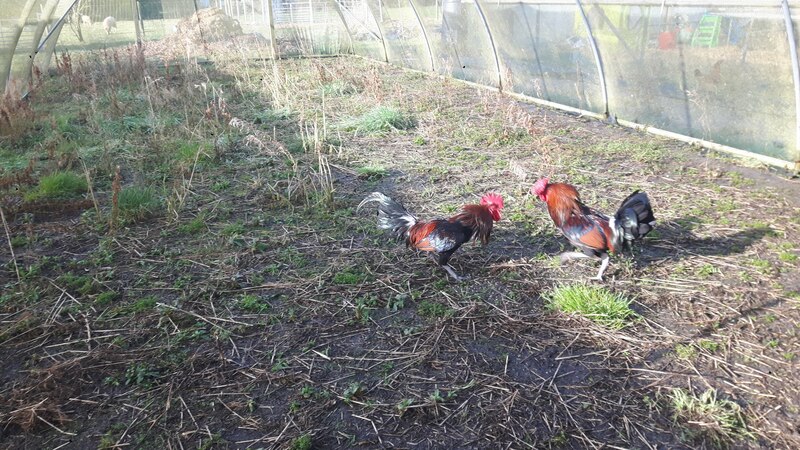 The chickens now have free range of the land (which they love, although some still think the garden grass is greener) but it means they have attacked our muck heap and giant compost heap, spreading things everywhere. So we are using 4 heras panels to enclose the muck heap. 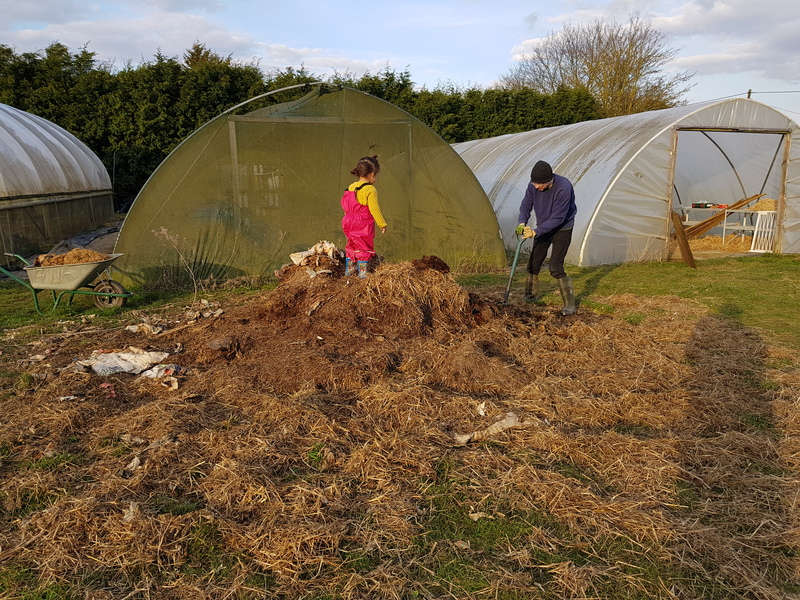 We would love to have a row of 3 or 4 neat contained compost heaps that we could use to turn the compost as it matures and keep things manageable. Unfortunately this year has a gazillion jobs we want to be doing so the muck heap is low down, we’ll contain it and just pile everything up. 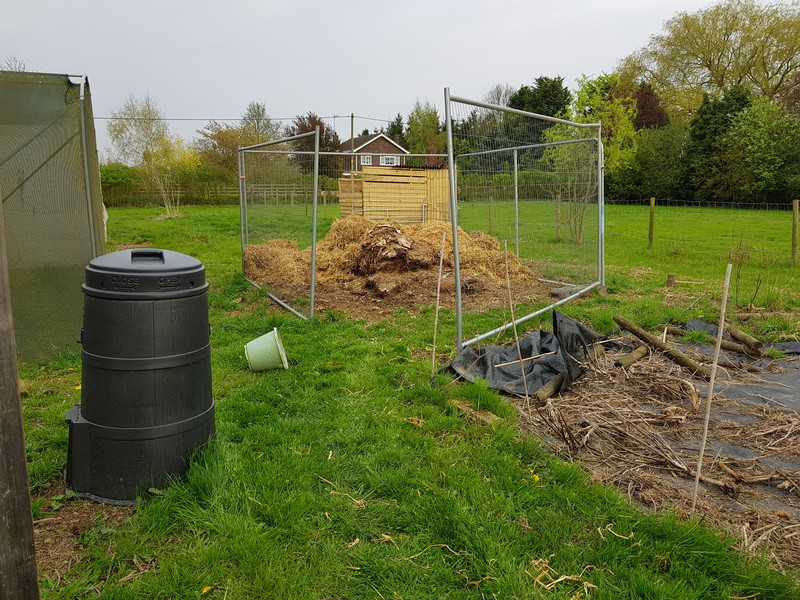 Hopefully next year, when we have the fruit patch contained and raised beds in the polytunnel, we can work on building some nice compost heaps. 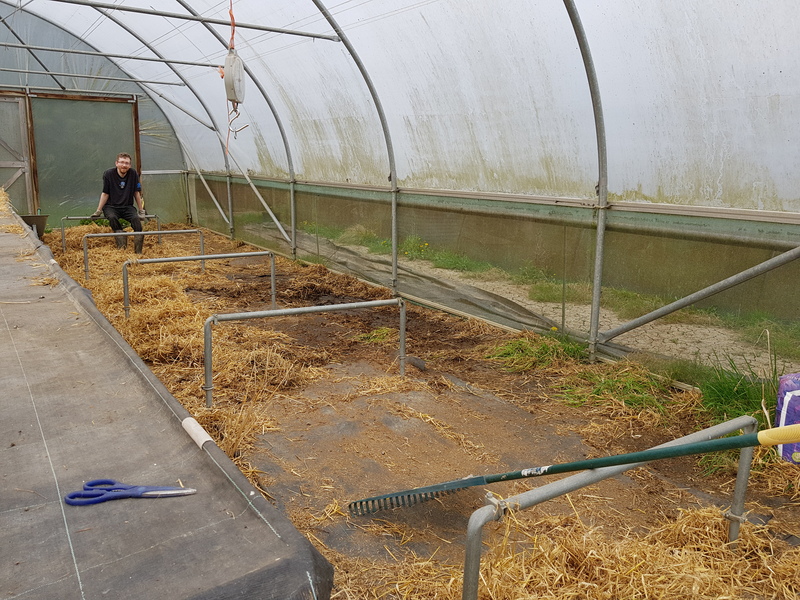 Sam managed to finish it and then he cleared out all the straw from the polytunnel from our lambing last year. We’re a bit behind on it I know! Whilst he was working hard at that I attacked the beds again. I’m very against using products to kill the weeds. We aren’t registered organic but I really try to raise our animals and grow our crops with organic principles in mind, possibly too much so. Neglect over the end of summer, through autumn and winter meant that the thistle on our land moved into the polytunnel. We have beds of it. Some good friends cleared one bed for me at the end of last year but thistles are persistent. We had a slight problem with them last year but by weeding them pretty much daily, pulling the new shoots as soon as I can see them I managed to weaken the root system enough that over summer I had no problems with them at all. So I’m taking that approach again. Pulling up every thistle I can find in the polytunnel with as much of the roots as possible. It’s not easy as kneeling and bending are quite hard work for me at the moment but I think I am getting somewhere. I just need to keep on top of it. The beds are all a bit merged but we’ll sort them out once we get the sides on and manage to keep the chickens out! Chi had some great fun feeding some of the flowering purple sprouting broccoli to the ewes, I think they enjoyed it too. Sometimes it’s the small moments, like seeing her barefoot, smiling and feeding sheep, that boost my confidence that we are doing something good for her here. Sunday’s task was to be the fruit patch so we spent Saturday night going through all our notes from last year about the size of patch, the plants that are in and the distances between them. I have signed up to The Old Farmer’s Almanac Garden Planner. It’s a paid for service, although there is a free trial, but I really like it. I used it to plan the garden in Scotland but didn’t really follow up with it. It can give you updates about when to plant things, spacing and means you can go back and see what was planted where and when. I have one for the polytunnel and now for the fruit patch. I don’t think we will get anything into the outdoor veg patch this year, the covers can remain in place to kill the weeds for a while longer. You can see the fruit patch plan here. Sunday morning we headed straight out. My mum came up and joined us for a few hours in the afternoon which gave us a bit more freedom to work as Chi played with her. 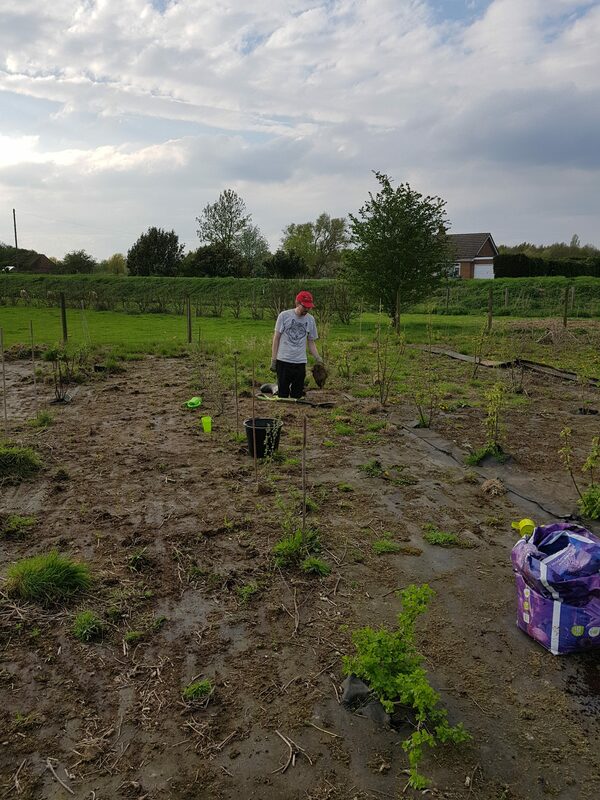 We managed to plant 9 new bushes, giving us 9 blueberries, 8 gooseberries, 3 blackcurrants, 7 red currants and and 8 white currants. The garden centre we visited on Friday has some very mature bushes going very cheap so if I can get down there I’ll grab some to fill in the black currant and red currant gaps. 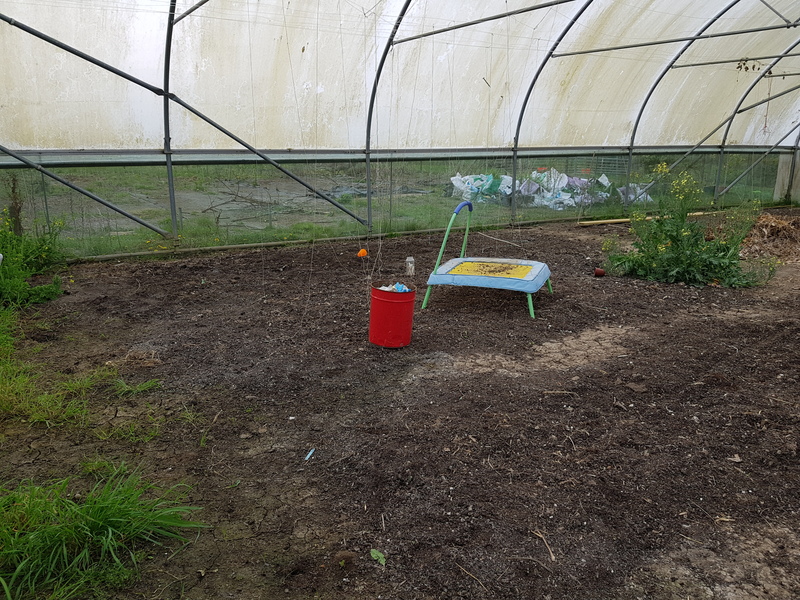 Sam worked on clearing the weeds from the weed proof fabric, I think we may need to put woodchip down over the fabric but the fruit patch is Sam’s part of the smallholding so he gets final say on everything. Last year we were trying to improve the soil and thought we would cover the whole patch in a thick layer of manure. It didn’t quite happen but we did pull up a strip of weed proof fabric and gave a good foot of manure to it. That has rotted down now which is great but the thistles loved it! (Are you sensing a theme here?) 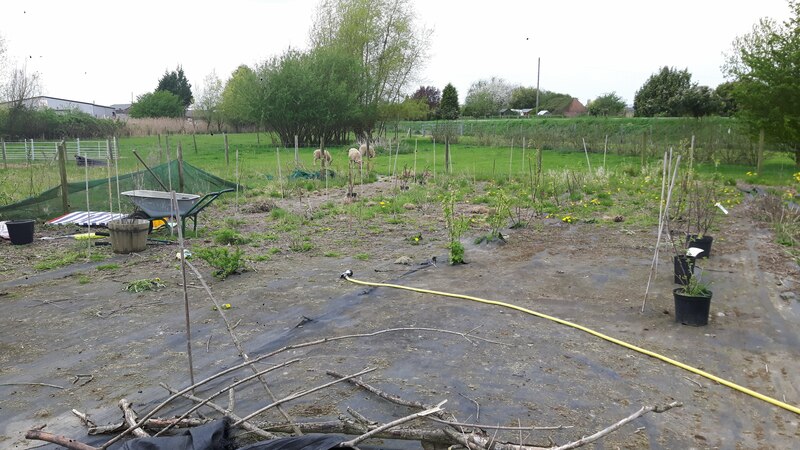 So my next job on the fruit patch is pulling the thistles that are there, once that is done we will cover it over with weedproof fabric again and get the loganberry, raspberry and blackberry planted down that side. We are hoping as they grow they will provide a bit of shelter to the sheep (or anyone else) who grazes in polytunnel way. It really, really feels as though things are moving in a positive direction on the holding. 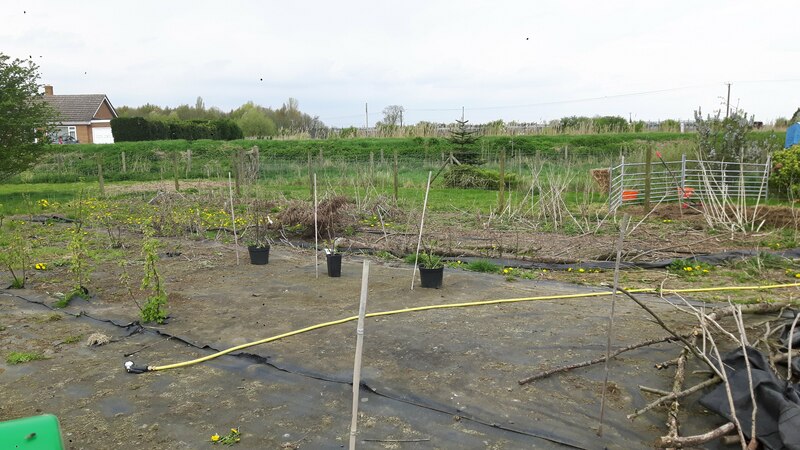 Of course it is April so we have had showers this week, limiting what I can do with Chi outside, but I managed to do another bit of thistle weeding on Monday and hope to do some more on Thursday. I’ve been using the rainy time to focus on getting the inside of the house under control (I am nesting after all) and had to do some pregnancy research in the evenings but I am hoping that tonight I will get some seeds in to trays inside and really kick our growing off. Better late than never hey? Then it will be working towards making some raised beds in the polytunnel for my nice new seedlings to go into. It feels all go here at the moment, which is exhausting but oh so good! We’ve finally done the renovations to the chicken house. I have to say that whilst I provided a lot of the ideas for the design the actual work was pretty much all Sam. Our first attempt at a chicken house had two perches at different heights and two external nest boxes. We soon found that the chickens didn’t like the external nest boxes, they had a slight leak. We used some plastic Ikea boxes to make two internal nest boxes and they proved to be a hit. As our chicken numbers increased we needed to change the house around. We planned to do the changes swiftly but as always things got delayed. First was putting in longer perches, but this meant that the perches went over the two internal nest boxes and cleaning up the house each week took a lot longer. We now have a shiny new poop tray. 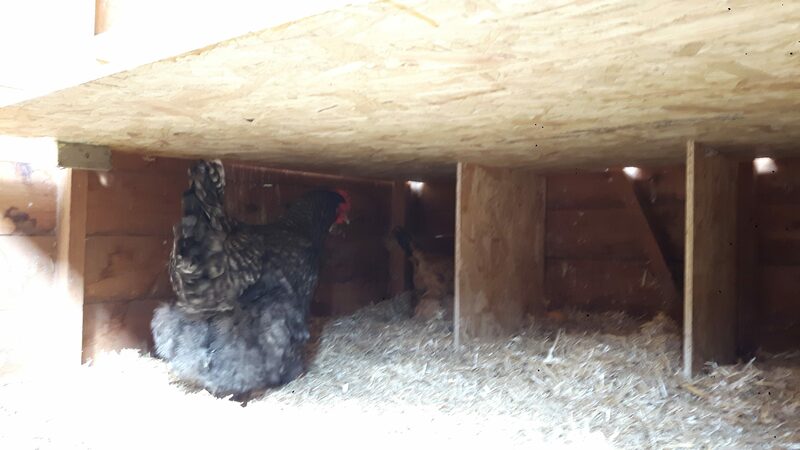 It’s been varnished and covers the underneath of the perches so I am hoping that rather than picking poo out of the chopped straw bedding I will be able to simply scrape it off of the tray. This will be so much easier and will be better for composting. The next step was nest boxes underneath the poop tray. We went for dividers that go from the floor to the underside of the poop tray. We used the same width as the Ikea boxes as the chickens seemed to really like these. We managed to fit 6 in. Due to the depth of the poop tray these boxes are nice and dark so hopefully the chickens will like them. It also takes us to 8 nest boxes between 23 hens, hopefully some of the hens will feel less inclined to make their nests in the bushes. 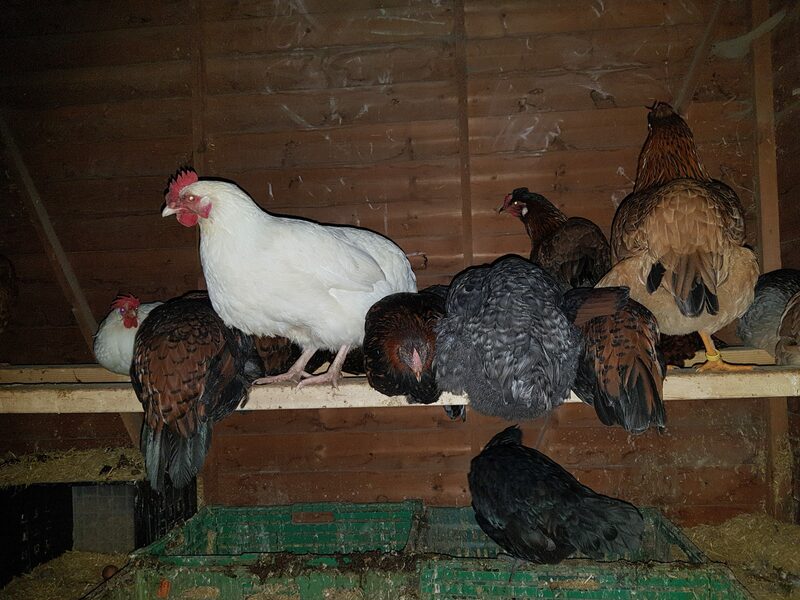 Some of the hens have already started laying in the new nest boxes which is encouraging. Of course having the nest boxes so far back means that it’s hard for us to get to the eggs. The next development for the house was knocking some panels out of the back of the house and putting a flap in to access the eggs. It took us the best part of a week to get that part finished, using boards held down by paving slabs in the meantime but the job is done. Then that’s it, the house is finished. The chickens have been a bit disrupted with all the work going on so we’ve seen a dip in the egg laying. It’s mostly the Derbyshire Redcaps, our most flighty chickens. Instead of getting 8 or 9 eggs a day from them we are getting 4, so the others are off laying elsewhere. I’ll have to try and track down those nests and hope that as they see the others using the nest boxes inside the house they will start laying inside again. 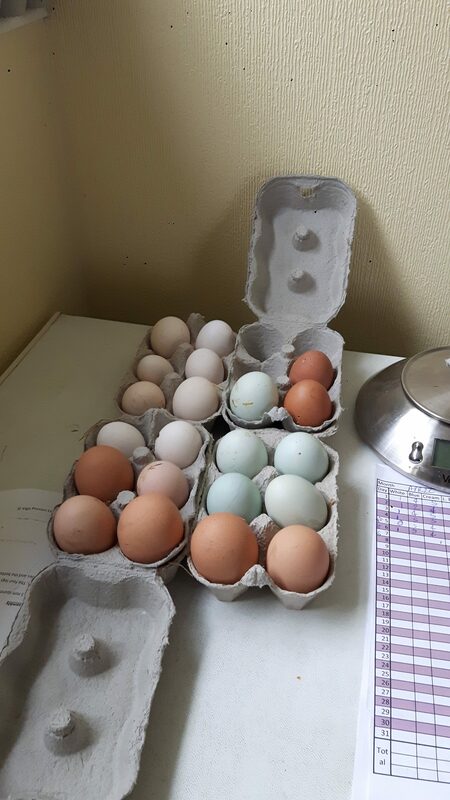 We are up to 20 eggs being laid in the house, which with 23 hens isn’t a bad day’s haul. It feels really good to have a big job checked off our to do list. 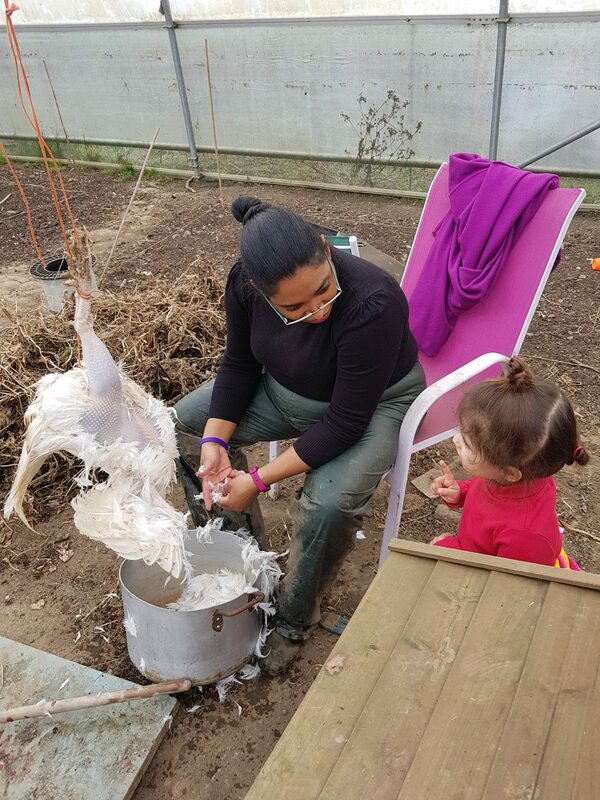 Now to do the same with the other jobs (finish planting fruit bushes and net fruit patch, raised beds in polytunnel and chicken proof doors, fix the shed roof, chicken fencing, compost heaps – oh how the list goes on!). We’re having a bit of a freezer crisis at the moment. We’ve got quite a lot of home grown fruit, veg and meat in the freezers now, as well as some bought in pork from other smallholders. This means that we are nearing capacity, which of course is brilliant, if I can get sorted with using what is inside then it will really lower our food costs and is in tune with the whole reason for this smallholding, eating home grown produce. We did really well at getting on with the preserving last year, apple sauce, apple and cucumber chutney, lots of jams, passatas, apple juice and wine etc but the freezers are still quite full. I’m pregnant and due in August, that means that during our peak harvest of fruit and veg and when we shall be getting hogget and possibly mutton back from the butchers I be either heavily pregnant or dealing with a newborn. 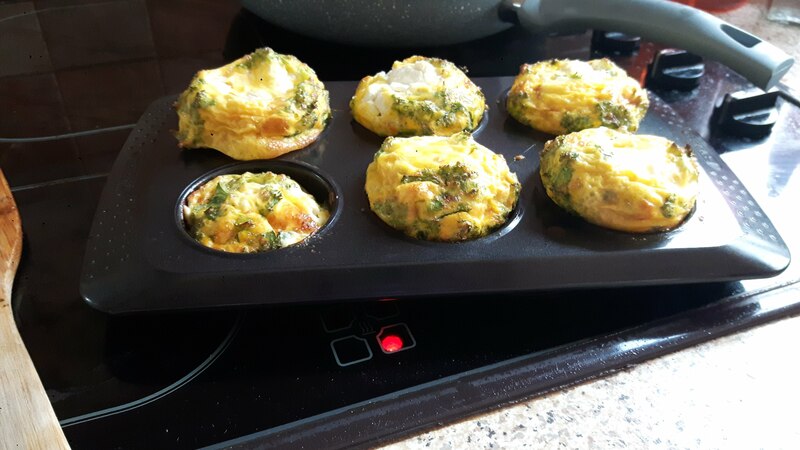 I’m not sure how productive I will be in the kitchen, but given the state of my hips currently I think it’s a good idea to bet on me not doing much at all. So what will we do with all the produce? Wash, chop and shove in the freezer of course! Then, when baby is older I can start working through it. The issue is there is no space for a summer’s worth of produce at the moment, so I need to get clearing while I still can. That brings me to this post, and hopefully a few more along the same lines in the coming months. Emptying the freezers and turning the contents into tasty and in some cases, long lasting, foods. We kicked off this process this week with the immanent arrival of 3 geese and 2 chickens for the chest freezer. At the end of last year we were drowning in apples and, after contacting Vigo Presses, I washed, chopped and frozen 2 builders buckets of cooking apples. Just straight in the freezer with some cling film over the top. These came out along with a small bag of Beauty of Bath apples. We popped them in an empty fridge to defrost for a couple days and dusted off the apple press. Vigo had suggested that if doing the apples from frozen we may benefit from a mesh bag to put the crushed pieces into inside the press. I can’t remember what stopped me from buying it at the time but I am guessing eventually the tab got closed on my computer and it got forgotten about. I’m not sure we actually needed to crush the apples, they pretty much turned to a mush despite still being a little frozen. We then got to the pressing stage and soon realised the reasoning behind needing the mesh bag. A fair amount of the apple just squeezed through the press and we even got some spurting. It was certainly going to be a cloudy apple juice. As we couldn’t press it too much the mush ended up being quite wet at the end, much wetter than we would have liked so a lot of juice remained in it. If we had the bag we could have probably gotten it a lot drier and gotten more juice. Yep we need a mesh bag! We took the juice inside and poured it through a small colander into a pot, we had about 10 pints of juice. We left it to sit for a while as I was feeling a bit broken by the point but I’m glad we did. When I went back to it there was quite a bit of frothy scum that had risen to the top. We had this with our first batch of juice and Vigo had said then that letting it stand may reduce that. I scooped off the scum and bottled the juice. It went into the pasteuriser which had been filled with cold water and set to 75°C for 25 mins. We sat down to watch TV and forgot about it so it had long been done by the time I remembered. The bottles were still too hot to touch though. Being so hot for so long may have affected the flavour but hopefully not, we haven’t opened a bottle yet although we did taste some freshly pressed juice which was lovely. I used our nifty grabby tool to get the bottles out, tightened the caps and lay them on their sides. There is still quite a lot of scum so I think we will leave the juice to stand for longer next time. 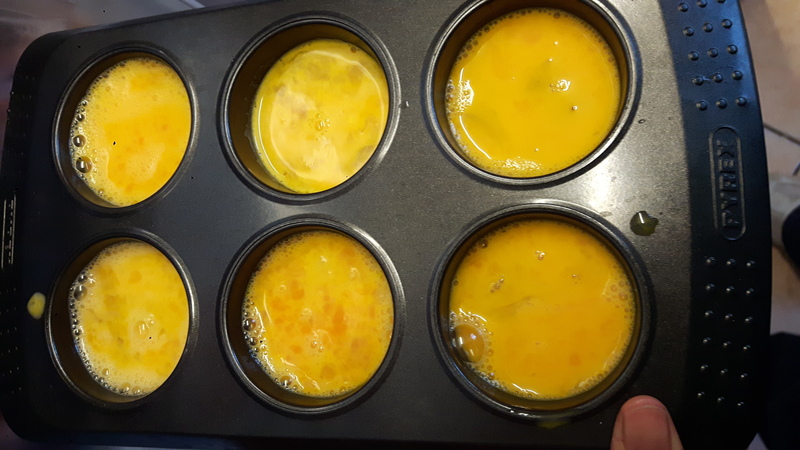 The juice is also quite dark after pasteurising but this time I didn’t bother with ascorbic acid or citric acid, the juice tastes fine as is and I just didn’t feel like adding extra things in just for aesthetics. Just to pop labels on them and drink them in the next 1-2 years. A learning experience to be sure, but we now know we can juice from frozen apples and have some ideas on how to improve the process. As a bonus it made just enough space for the geese and chickens which went into the freezer the next afternoon.